Republican Gov. Mike Dunleavy is moving to fire the chairman of the commission that oversees oil and gas operations in Alaska, accusing him of five offenses including security breaches, chronic absenteeism and browbeating other commissioners, according to a Jan. 17 letter from the governor. The two-page letter provides limited details of the alleged missteps by Hollis French, an attorney and former Democratic state senator from Anchorage. French was appointed to the three-member Alaska Oil and Gas Conservation Commission in 2016 by Dunleavy’s predecessor and former opponent in the governor’s race, Bill Walker, an independent. “I think this is happening because I have been firmly standing up for the public interest in oil and gas conservation,” French said Friday. The governor’s letter to French lists “potential grounds" for his removal from office “for cause.” It was first reported by Alaska Public Media on Thursday. A three-day public hearing on the issue ended Friday. Private attorney Tim Petumenos served as hearing officer after accepting a request from the governor to do so. French, on Friday, said he submitted an exhibit showing correspondence between his two fellow commissioners, Dan Seamount and Cathy Foerster, addressing their attempt to oust him from the board. Petumenos said the exhibits in the case would be made public after he issues his findings in the coming days. Asked why the commissioners sought his ouster, French on Friday shrugged and said he would not comment before Petumenos issued his findings. The governor will make the ultimate determination in the case, Petumenos said Friday. The state Department of Law conducted the investigation into the case, said Matt Shuckerow, a spokesman for Dunleavy. The governor’s letter says that French, who has a salary of $145,000 annually, breached “critical” security protocols by giving the press information about the “means of accessing” confidential data, as well as the whereabouts of that data, from the lone well drilled in the Arctic National Wildlife Refuge in the mid-1980s, known as KIC-1 well. Dunleavy does not accuse French of inappropriately releasing the data itself. Information about what the well uncovered has been one of the industry’s tightest secrets, and speculation has only increased as the federal government over the last year moved to allow the first drilling in the refuge since then. The governor’s letter does not provide additional detail about the security breaches. 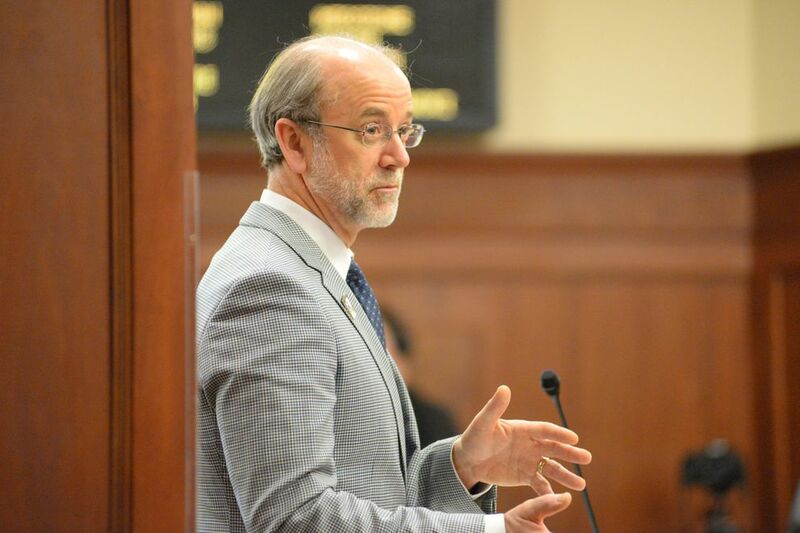 French, under questioning at the hearing Friday, acknowledged he had provided details about the location of the data, and security measures associated with it, in July 2017, to the Anchorage Daily News for a story about the secrecy behind the KIC-1 well. French told Petumenos he understood that a 1992 settlement between the state and oil companies was meant to protect the data the well had found, but not details about its location or security. “My reading of the settlement agreement is that the whole point of the exercise is to keep the data secret. That is, what did that company learn when it drilled that well? What were the (rock) strata? The (rock) porosity? What’s going on downhole?" French said. Foerster, in an interview with ADN for the same 2017 story, also shared the data’s location and details about the security measures surrounding it. Foerster on Friday told the ADN she did not. Foerster, a commissioner since 2005 who plans to leave the agency when her term ends this month, on Friday sat beside and conferred with the state’s attorney, Dana Burke, a senior assistant attorney general who is representing the state’s case. Foerster declined to address French’s allegation that she sought to oust him. “Out of respect for the process and the parties involved, I have nothing to say,” Foerster said. At least one former commissioner, David Johnston, in a story in the Daily News in 1995, shared details about the data’s location in the agency’s Anchorage office, and some of the complicated security procedures, locked behind a steel door, with two sensors to detect burglars. AOGCC, a quasi-judicial state agency, typically spends its time reviewing oil and gas operations, periodically levying fines for violations to prevent waste and accidents. Internal disputes rarely reach the public eye. But in 2003, Sarah Palin was the public member and chair of the board -- the same position held by French -- before she became the state’s governor. Palin found Randy Ruedrich, the former chief of the Alaska Republican Party, doing party business in his state job as the petroleum engineer on the commission. Ruedrich resigned from the commission that year. He settled state ethics charges by admitting wrongdoing and paying a fine of $12,000. Kevin Fitzgerald, an attorney representing French, said after the hearing that much of the tension on the commission now is related to French’s goals of expanding the agency’s jurisdiction to prevent more natural gas from being wasted. The other commissioners have disagreed with French, Fitzgerald said. • Typically comes to work four hours daily or less, despite policy that sets work weeks at 37.5 hours. • Has “disrupted” the commission by pervasively browbeating fellow commissioners for decisions he doesn’t agree with. The letter does not describe specific incidents. • Publicly promoted views contrary to the commission’s position. The letter does not provide specific details. • Refused to perform job-related tasks, and pursued non-work interests on the job. Again, specific details aren’t provided. “Alaskans reasonably expect, and have the right to, commissioners, agency heads, and other high-ranking officials that perform the work they are paid to do, and who do not actively undermine agencies they represent,” Dunleavy said in the letter. Dunleavy, in a Jan. 22 letter to Petumenos, said the critical question is whether there is sufficient evidence to remove French from office for cause associated with misconduct or neglect. State law allows a governor to remove an oil and gas commissioner “for cause," but must give the commissioner a chance to defend themselves in a public hearing. Dunleavy, in that letter, asks Petumenos to forward his findings by Feb. 18. Petumenos said he plans to do so earlier than that.